Chinese urbanization process continues to move forward, diesel concrete mixer equipment gets rapid development and application. But many people do not know the advantages of concrete mixer, today we will talk about the advantages of concrete mixer equipment. The new environmental friendly material is a major trend in the development of building materials. Along with the blowing of comprehensive utilization of concrete resources policy, concrete machinery manufacturers pay more attention to the concrete equipment, so as to increase competition ability in market. Zhengzhou CamelWay Machinery is a professional concrete equipment manufacturer, the products including small concrete mixer, diesel concrete mixer, and so on. Our diesel concrete mixers are widely used in the industries of building projects, railway, highway, energy, cement, chemicals, construction and so on. 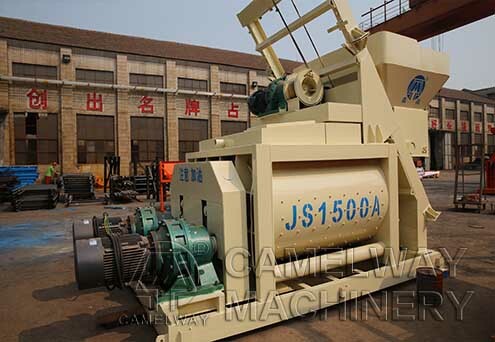 The discharging size can be adjusted and the mixing specifications are various. Simple structure, low energy consumption, high output, smaller weight and uniform granularity show the advantages of diesel concrete mixer. With the growing demand, there are more and more diesel concrete mixer models in market. Henan Zhengzhou CamelWay machinery provides all kinds of concrete mixers. If you have any requirement, contact us freely.